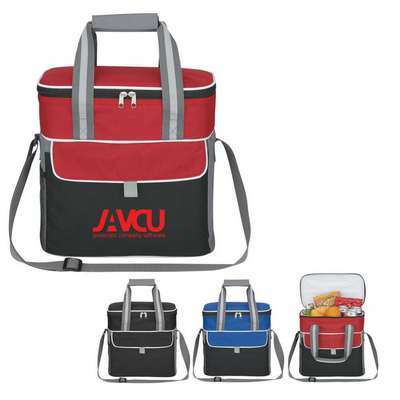 The Pack-N-Go Kooler Bag is a useful and effective gift for employees and customers. Add your business logo and tagline using silk screen imprinting and enhance your brand’s image. The Pack-N-Go Kooler Bag is a useful and effective gift for employees and customers. Add your business logo and tagline using silk screen imprinting and enhance your brand’s image. The Pack-N-Go Kooler Bag is made using a combination of 600D polyester. The adjustable shoulder strap makes it easy to sling it across your shoulder. Nylon web handles, with Velcro® comfort grip, make carrying it a pleasure. Separate items, as per your convenience, in the double zippered main compartment. Use the side mesh pocket to access frequently used items. Use the front pocket, with Velcro® closure, to keep small items safe and secure.